Brexit – Now there is a word that has been thrown around extensively in the last few years, especially within the property market. The most common phrase I hear from agents is that they are looking to cut marketing budgets because of the “uncertainty”. I agree in some respect that agents need to look at their overheads and really start to see where they can shave costs from their businesses. I think every business needs to conduct these types of activities every 6 months or so to improve overall efficiency… however what I will argue is marketing, especially in the digital space should not be one of those costs to cut. So what have we witnessed in the last 2 years since the referendum vote? We’ve seen a steady rise in house prices in the UK despite a slump in the house price growth. We’ve seen that average stock per branch has risen year on year as well as experiencing relative stability in the amount of housing transitions since June 2016. From a Google Ads point of view the search volumes during that last 2 years within the UK have been also remained relatively consistent. During this period of political and economical uncertainty, agents should be figuring out how to most effectively target vendors who are looking to sell their properties. Any given estate agent will have a region or a radius that they cover. Just because you have a branch in one location doesn’t mean of course that you only specialise in that location. The trick here is how do you get vendors to realise that. One way is to target specific locations on paid search using a geo-location tool that will extract sub locations within your chosen region. I hate to say it, but this is something Purple Bricks do very well; being able to target every major town and city in the UK through location-based searches. Let’s say you’re a smaller, more traditional agent covering a 10 mile radius of Reading. 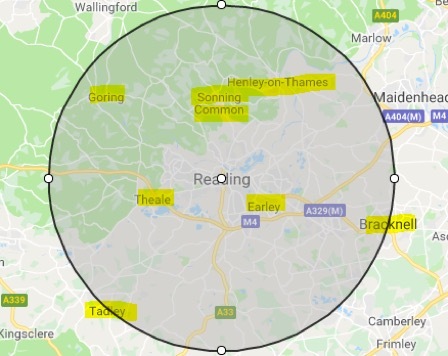 You might have relatively good organic ranking under “estate agent Reading” but the question is how are you best targeting vendors that are within that 10 mile radius? Leafleting? (no one reads these) Local newspaper? (if you’re trying to target the older generation) Or do you invest in a targeted location based Google Ads campaign? (where 95% of people begin their property search). Here we can see 7 different locations within that 10 mile radius. We zoom further and now see 30 different locations and 30 different opportunities to market your agency. So my final notion is this. Brexit we all know is causing uncertainty politically, economically and socially. However, I argue this is a time to reflect on your business processes and instead of “well we are just going to wait until the market picks up again” approach. Use this time to get ahead of your local competition so that by the time the market looks less volatile, you’re already ahead of the game. There is after all a value is stability over decline.